We offer an exciting collection of fabrics and a choice of styles to suit any home. 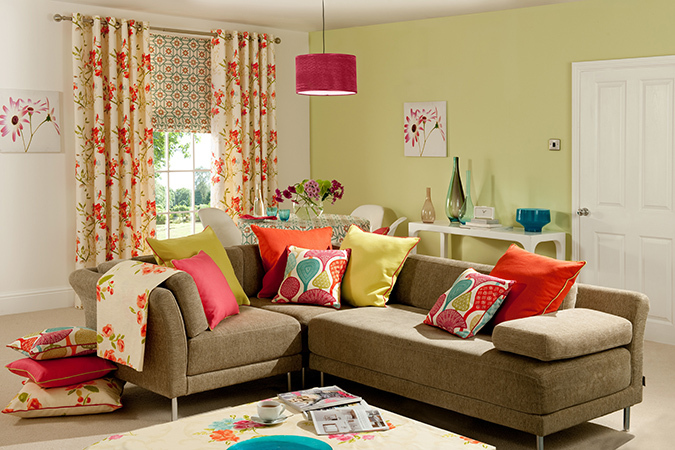 But to suit your home, we can cut curtains to your specific size and shape in only 7 days! You simply tell us what you want and we help create the ideal solution - and not just through ensuring it is made-to-measure. We have a choice of linings (for example, lined, unlined or blackout), a selection of Pencil Pleat, Pinch Pleat, Tab Top and Eyelet headings as well as a sample service for hundreds of fabrics options including prints, jacquards, plains and velvets. Our range comes complete with poles and tracks. We even have a range especially for children. Take a look at our window blinds systems and fabrics for roller blinds, Roman blinds, Venetian blinds and Vertical blinds. We have the very latest in interior trends, colours and fashions which are all available to match your specification and complement your home.